These are well designed and crafted freewheel hubset. The hub shell is a one piece aluminum construction that is turned and polished. The hub shell has special precision sealed bearing cartridges pressed into it. These cartridges have been re-worked by WTB to permit fresh grease to be injected into the bearing with a special rear seal that allows old grease to be purged from the bearing at the same moment, where it can be wiped away at the axle ends. To access this feature of the hub there are two grease "ports" pressed into the hub shell, one for each bearing side. With the "Goose Greaser" grease pump, the miniature "zerk" fitting is opened and allows grease from the outside world into the inner bearing. These are the two openings at the right and left of the Grease Guard logo on the shell. Through the bearings and the hub shell is a thinwall, hollow, stainless steel axle. To assure a perfect fit to your fork ends and dropouts the hubs come with several thin precision stainless steel and aluminum spacers. At the both ends of each axle are forged, then machined aluminum caps that reduce the axle dimension to the skewer dimension. These caps provide the final spacing for each hub and require a drop of oil to actually be able to slide on the axle because they are machined to such close tolerances, in fact they fit the way a piston does in a cylinder head. The hubset is available in a Black or Silver anodized finish. The front hub has a 57mm hub flange diameter, with flanges spaced 77mm apart. The front spoke holes have a 46.5mm perimeter circle diameter. The rear hub has a 69.5mm hub flange diameter, with the flanges spaced 55mm apart. The rear spoke holes have a 59mm center circle diameter. The front hub weighs 156.5 grams, the rear hub (136mm axle), without cogs, weighs 235.5 grams. 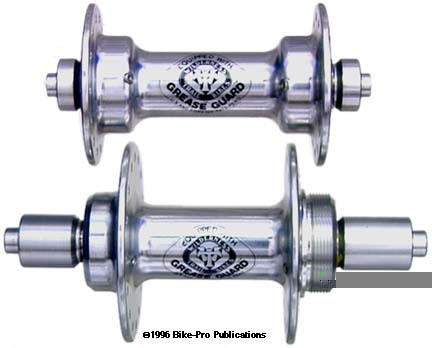 These, large (high) flange hubs do not come with skewers and are for use with a freewheel only that must be provided separately. Lastly, the hubset does not come with the grease gun or grease, these are available separately in our lubricants section. Be sure to include the rear axle width desired, either 126mm, 131mm or 136mm, hole patterns 28 hole, 32 hole or 36 hole, (they can be split patterns front and rear), and color, either Black, Grey or Silver.